One of the most popular posts on this blog is the one that describes how I made a knight’s tunic for Kaelan to wear to a party. I would never have guessed that it would be looked at so often! And he was such a reluctant model too. We have since misplaced that tunic – I’m sure it is around somewhere! – and are now working on rebuilding the necessary parts to a well-dressed and well-armoured knight. It has been quite the process that has involved a surprising journey deep into our sense of what we value in terms of building and maintaining relationships, also some re-visioning of how we approach ‘behaviour management’ in our family, and how we demonstrate respect to each and every person in our family. It started with the tantrums. At six and a half years of age our guy can still let loose some magnificent tantrums, completely out of the blue, and as exhausting for everyone as they are mystifying. I thought we would have had the tantrums done and dusted after he moved through the 2- to 4-year-old phase of life, and indeed we had a wonderful period of grace from 5 -6 where the big-one meltdowns were few and far between. I guess it took us by surprise when they started happening again. Oh we tried to understand it all from every angle, my early childhood training kicked in and I went back to the basics of keeping our lives simple, predictable, beautiful, orderly …. etc. Definitely part of it is tiredness, part of it is growing up, part of it is living with two families and five other children, part of it is being deaf (and thus being required to concentrate to communicate). Too many variables to manage! This is representative of the sword that Kaelan had to ‘earn’ when he was five years old. He had to demonstrate knightly behaviour before he was given his sword. He painted it himself and he was knighted with it, on the understanding that so long as he was careful and valiant and caring, he could use his sword. As time went by the inspiration for such gallant behaviour waned a little, replaced by the enthusiasm of the boyish play of a five-to-six-year-old … and thus a few times he lost the right to use his sword. So I thought he could earn his sword back. He really wanted it, so we drew this up together, and talked about what sort of behaviour is required from everyone in our household, and what sort of things he could demonstrate. 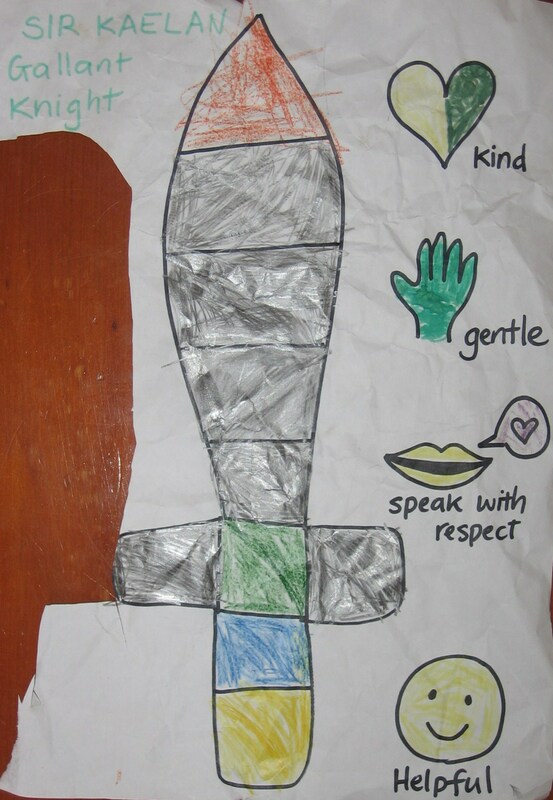 At the end of each day we’d reflect over how his efforts at being helpful and gentle and kind and respectful, and colour in a section of the sword (the paper now has a few bits missing, as after it served its purpose it sacrificed part of itself to make a paper mobile phone!). He LOVED the idea and for the first three days embraced it whole-heartedly. Then the shine wore off and it seemed as though he was wearing this responsibility like a heavy cloak that he could hardly move in. The tantrums and rudeness returned and we, in reaction, also stopped looking for the positive in his behaviour and started again to nag about the negative. Days would go by where we would snap “Well THAT sort of behaviour won’t get your sword coloured in, will it?” And so the picture of the sword remained, stuck on the fridge, half-coloured … and his own sword remained out of reach, seemingly forever. It was up high on the bookshelf, but it might as well have been stuck in the stone with the magic of Merlin. At this rate he would never get it back. We REALLY wanted him to have his sword back, and we REALLY wanted our happy son back, as much as he wanted his sword, and he wanted a way out of the exhausting meltdowns. It just wasn’t working, so we tried another tactic. More about it next time I write … I’ve blogged a little too long today and there is a longer story to tell about this!